Dr. Bear Bot’s “robot-only” parking space in the Cardiac ICU. 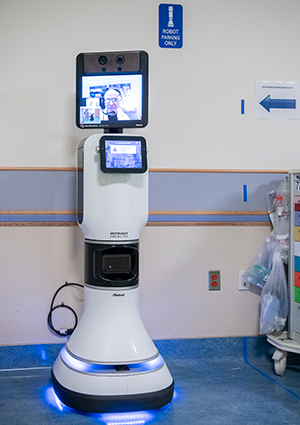 Alejandro Lopez-Magallon, M.D., is featured on the robot display screen, where he drives the robot from his location in the command center, in order to visit patient rooms and capture additional medical information and connect with patients, parents, and attending nurses and physicians. 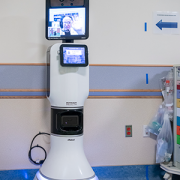 The telemedicine robot at Children’s National arrived in late August 2018 and recently completed a 90-day test period in the tele-cardiac intensive care unit (cardiac ICU) at Children’s National. The bot travels between rooms as a virtual liaison connecting patients and attending nurses and physicians with Ricardo Munoz, M.D., executive director of the telemedicine program and the division chief of critical cardiac care, and Alejandro Lopez-Magallon, M.D., a cardiologist and medical director of the telemedicine program. Drs. Munoz and Lopez-Magallon use a nine-screen virtual command center to remotely monitor patient vitals, especially for infants and children who are recovering from congenital heart surgery, flown in for an emergency diagnostic procedure, such as a catheterization, or who are in the process of receiving a heart or kidney transplant. Instead of traveling to individual rooms to check in on the status of one patient, the doctors can now monitor multiple patients simultaneously, enhancing their ability to diagnose, care for and intervene during critical events. If Drs. Munoz or Lopez-Magallon need to take an X-ray or further examine a patient, they drive the robot from its ‘robot-only’ parking space adjacent to the nurse’s station, and connect with attending doctors and nurses in the teaming area. The onsite clinicians accompany one of the telemedicine doctors, both of whom remain in the command center but appear virtually on the robot’s display screen, to the patient’s room to capture additional medical information and to connect with patients and families. Over time, the telemedicine team will measure models of efficiency in the tele-cardiac ICU, such as through-put, care coordination, and standards of safety, quality and care, measured by quality of life and short- and long-term patient health outcomes. This test run will serve as a model for future command centers offering remote critical care. 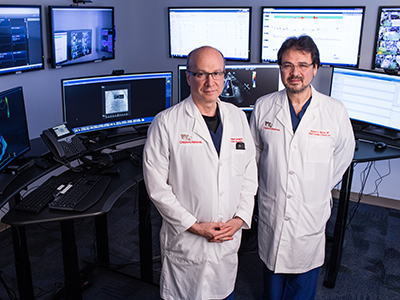 (R) Ricardo Munoz, M.D., executive director of the telemedicine program and the division chief of critical cardiac care, and Alejandro Lopez-Magallon, M.D., a cardiologist and the associate medical director of the telemedicine program in the tele-cardiac ICU command center. 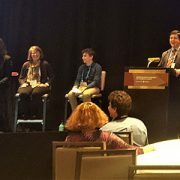 The ongoing virtual connection program that Dr. Atabaki references launched in spring 2016 and has enabled 900 children to connect to a doctor from a computer, tablet or smart phone, which has saved families 1,600 driving hours and more than 41,000 miles over a two-year period. 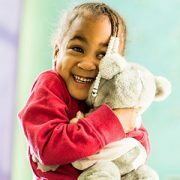 Through this program, virtual care is provided to children in our region by 20 subspecialists, including cardiologists, dermatologists, neurologists, urgent care doctors, geneticists, gastroenterologists and endocrinologists. 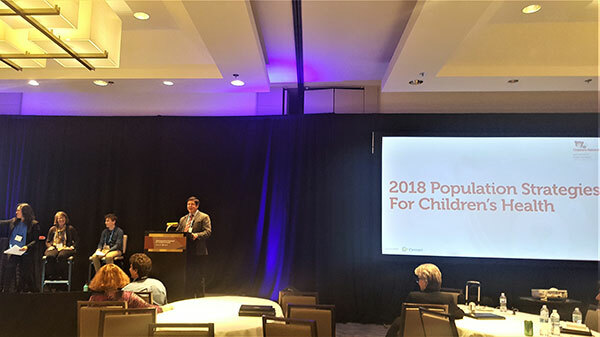 To extend the benefits of virtual communication, while saving mileage and time, Dr. Atabaki and the telemedicine team at Children’s National will partner with K-12 school systems, local hospitals and health centers and global health systems. 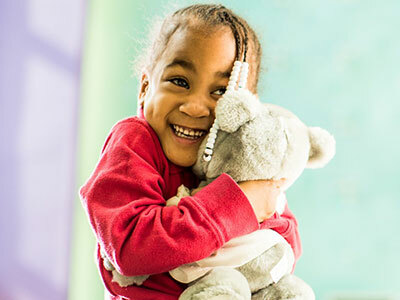 The Children’s National robot was named Dr. Bear Bot after a 21-day voting period with patients and staff, beating 14 other child-selected names, including SMARTy (Special Medical Access to Remote Technology), Dr. Bot and Rosie. Dr. Bear Bot celebrated with an official reveal party on Valentine’s Day, which was streamed to over 220 patients through the hospital’s closed-circuit television and radio station.